The best and most catchy number in this entire album. With expectations high on first time Yuvan – Pawan combination, Yuvan lives upto them and comes up with a high energetic track. Ramajogaiah Sastry’s lyrics like Nee churachurachura choopulE panjaa take you into right imaginative mood where one can see Pawan in action. Expressions like Aakaasam nee panjaa, Aavesam nee panjaa.. cheDunantam chese chaitanyam.. show depth in lyrics and feel about the character. Yuvan’s voice and his usage of BGMs keep up the pace in this song. If this track is used in background score of the movie, it will surely haunt viewers for long time. Neatly written and composed duet where Chandrabose’s lyrics express both lovers supressed feeling of love and lack of expression. But chandrabose does magic here by matching both male and female expressions when female sings idi telupabOtE bhaasha chaallEdelaa.. and male takes over from there as naa bhaasha lOni tiyyandanam..neevallE neevallE. Content rich lyric, well composed and sung, this will more useful while narrating story visually. Ramajogaiah Sastry seems to have become an expert in writing raunchy item numbers these days. After his popular tracks like Jennifer Lopez in Jalsa, Poovai in Dookudu and many more.. this rythmic track will go down as one of the most played item numbers of recent times. Saloni’s husky and rough voice adds upto the mood of this track. This mini song gives a feel of heroine’s feelings and they sound very much like continuation of 2nd song Elaa Elaa and its also in same tune. One more melodious duet written by chandrabose gives you feel of two people just falling in love and trying to express their state of mind. This tracks seems to be used for situation where hero and heroine are starting their love life afresh and trying to adjust within it. Priya Himesh’s humming between interludes gives you feel of fresh love. Arguably the most awaited track of recent times, both audio and video wise as it has rocking combination of Pawan Kalyan and Brahmanandam. Its been long time since a full length comedy song was attempted and hats off to director Vishnuvardhan for this idea ! Ramajogaiah Sastry’s hilarious lyrics, mixed with dialogues of Pawan Kalyan and Brahmanandam rock this song. meesam lEni ‘mega’dheerudu, chesina manchini marchipoye ghajini ki cousin veedu, inkaa melligaa koDitE Tusss.., holi deepavali pandaga laage tana puttinaroju jaripincheddam, danikemo papavali ani pEreDadaam etc expressions are hilarious..
తర్వ్తాత ..? 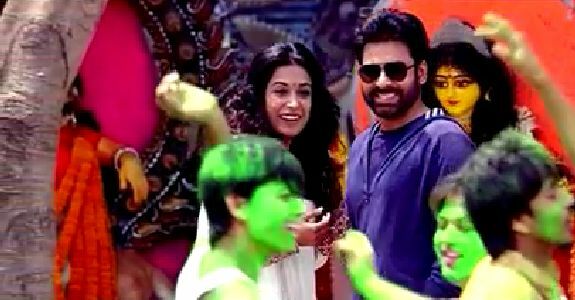 తర్వాతేంటి… కొట్టు…… PANJAA MUSIC ROCKS…………!